The results are undeniable. A clinical study investigating the bacteria-killing properties of copper has proven once again that the metal can play a leading role in fighting bacteria1 that cause healthcare-associated infections (HAIs). The paper also reached a second finding destined to shake-up the cleaning practices in the healthcare industry. 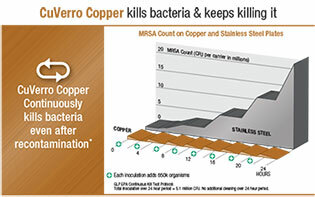 EPA-registered CuVerro®copper kills 99.9% of bacteria1 it comes in contact with including e. coli and superbugs MRSA and VRE. Bacterial loads do not rebound in patient rooms where surfaces are made of copper, whether the room is occupied or not. Germs quickly recolonize on surfaces made of stainless, plastic, or wood. 93 percent of patient rooms with copper surfaces remained at or near the recommended threshold for terminal cleaning (250 CFU/100 cm2). By contrast, less than half (49%) of the patient rooms without copper surfaces remained at the recommended clean threshold. 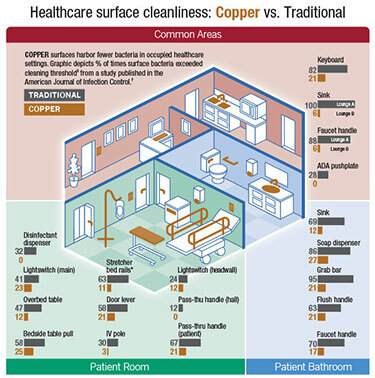 Researchers assert that in hospitals even the most conscientious cleaning does not do the job that copper does all on its own. Healthcare acquired infections kill 75,000 US patients each year and cost the country $45 billion. Using copper fixtures as part of an integrated infection control program could ease this tragic condition. Hinsa-Leasure’s team spent 18 months testing a range of high-touch surfaces in the medical-surgical unit at GRMC. The copper surfaces used in the study were EPA-registered CuVerro® copper alloys. Why are the results of the Grinnell College bactericidal copper study important? 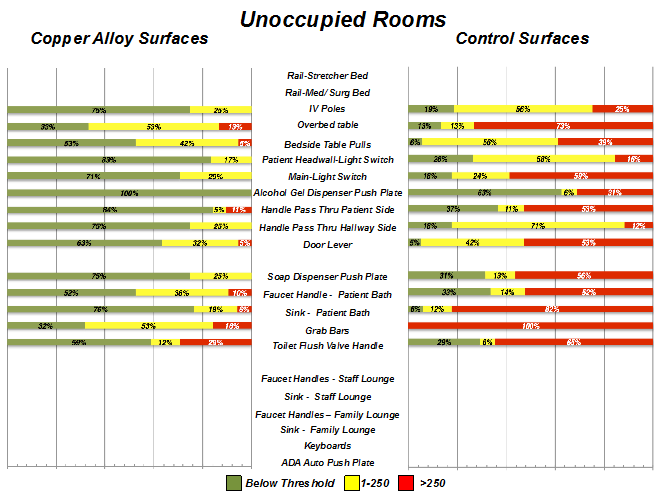 The study reaffirms the benefit of using bactericidal copper for high-touch surfaces in healthcare facilities because it consistently showed significantly lower concentrations of bacteria on bactericidal copper surfaces than on control surfaces. The study tested 19 different touch surfaces ranging from IV poles and toilet handles to nurse station keyboards and automatic door push plates (to see the full list, click here). The study reveals that the bacterial levels in terminally cleaned unoccupied bactericidal copper rooms consistently remain at or below the cleanliness threshold. Rooms without bactericidal copper that are terminally cleaned following patient discharge quickly re-contaminate to levels above the cleanliness threshold even when they are unoccupied. The study is the first conducted in a general ward (non-ICU) environment and the first in a rural hospital. It also is the latest to evaluate bactericidal copper in healthcare environments, building on the existing body of research. What kinds of bacteria does bactericidal copper kill? Laboratory studies conducted under EPA-approved protocols have proven that, within two hours of contact, antimicrobial copper kills greater than 99.9% of the following disease-causing bacteria: Vancomycin-resistant Enterococcus (VRE), Staphylococcus aureus, Enterobacter aerogenes, Escherichia coli O157:H7 (E. coli O157:H7), Pseudomonas aeruginosa and Methicillin-resistant Staphylococcus aureus (MRSA). How quickly does bactericidal copper kill bacteria? Bactericidal copper begins killing bacteria* on contact and then continuously kills greater than 99.9% of bacteria* within two hours of exposure. Do the results of the study infer that hospitals are not doing enough to prevent healthcare-associated infections (HAIs)? It is estimated that one out of every twenty-five patients admitted gets an HAI. In 2011, 722,000 patients contracted HAIs and 10% died as a consequence. The Patient Protection and Affordable Care Act has increased scrutiny on this problem and added penalties for hospitals that do not reduce the number of HAIs under the Hospital-Acquired Condition Reduction Program (HACRP). In fact, every year the US hospitals in the worst-performing quartile will be penalized and lose some funding for not meeting HACRP standards established by the Centers for Medicare and Medicaid Services. Despite best practices, hospitals still face cleaning challenges. The Grinnell study demonstrates that bactericidal copper can be a strong ally in even cleaner healthcare spaces as these surfaces kill bacteria at rates unmatched by any other solid surface material. As a result, bactericidal copper alloys can help boost the effectiveness of integrated infection control programs. What is the active ingredient in bactericidal copper? Copper is the active ingredient! Copper has inherent bacteria-killing properties. There are several avenues for how bactericidal copper kills bacteria, but the simplest explanation is that copper ions flood the cell and rupture the membrane, causing the cell to lose vital nutrients and damaging the DNA, which leads to subsequent cell death. Learn more by clicking here. Since bactericidal copper surfaces kill bacteria, do they need to be cleaned? Yes. According to both good hygienic practices and EPA conditions of use, antimicrobial copper surfaces must be cleaned and sanitized according to standard practices and infection control guidelines. Does the Grinnell Regional Medical Center plan to install bactericidal copper fixtures throughout the rest of the facility? How long will it take? Yes. GRMC is in the process of installing bactericidal copper alloy touch surfaces throughout the remainder of the med-surg unit, and other departments throughout the facility, operating rooms, emergency departments, and the ICU. This transition is expected to be complete by early 2017. The study centered on a small rural hospital. Is there any reason to believe that larger urban medical centers have more effective programs for combatting infections? No. In fact, according to a 2016 Consumer Reports article, some of the biggest and most well-known hospitals tended to be rated lower in the area of infection-prevention. In addition, the GRMC protocol for infection control is on par with some of the most aggressive programs in the country and they believe adding bactericidal copper to their integrated infection control program makes the program even stronger, particularly in their efforts against antibiotic resistant bacteria. Size (number of beds) is not a factor; copper is the difference. 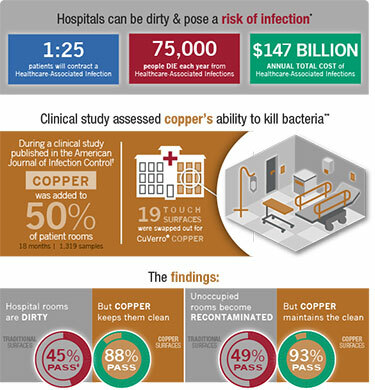 Based on the Grinnell study, there is ample reason to believe that similar results could be achieved by other hospitals that use bactericidal copper for high-touch surfaces in patient rooms and surgical suites. The US healthcare system is burdened by rising costs and copper is expensive. How can hospitals, particularly those with smaller budgets and in rural areas, afford the capital investment to install products made with bactericidal copper? The cost to outfit a patient room with products made from bactericidal copper starts at as little as $2.5K/room. Compared with other equipment costs, this is only a fraction of the cost of the room (~2.3% based on a 250 bed hospital). For a new hospital the cost is even less – about 0.2% of the construction cost/hospital. There are other potential cost related benefits. For example, staff attendance and, therefore staff productivity, might improve in an environment where hospital employees are exposed to fewer infectious bacteria. Doesn’t copper tarnish and turn green? Does this have an effect on its ability to kill bacteria? 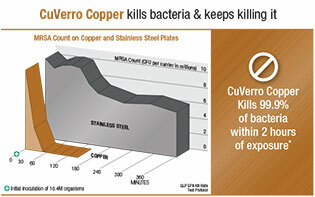 CuVerro® bactericidal copper alloys have been selected for their strength, durability, and tarnish-resistance. Because CuVerro is composed of a mix of copper and other metals, it will not oxidize like items made from 100% copper. All uncoated copper alloys are subject to natural oxidation, or patina, however, the effect is more comparable to the subtle surface changes typical of copper-nickel coins (like dimes, nickels, and quarters), which over time show minimal color change compared to the more noticeable oxidation that can develop on a copper penny, for example. Further, laboratory testing shows that bactericidal copper alloys retain their antimicrobial efficacy through normal oxidation. In other words, patina does not impair the antimicrobial effectiveness of the metal. How much of a drop in infectious disease transmission might we expect in an all bactericidal copper hospital environment? The Grinnell study only tested bioload on surfaces and not infection transmission, but there have been other more expansive copper studies conducted by leading microbiologists around the globe that could provide insight into this question. Is it possible to estimate how many lives might be saved if bactericidal copper was the metal of choice for hospitals? The data from this study only shows bioload on a range of surfaces, but there have been other more expansive copper studies conducted by leading microbiologists around the globe that could provide insight into this question. Has there been a reduction in the rate of infection transmission at GRMC that can be tied directly to the use of bactericidal copper fixtures? This study did not track infection transmission rates, but there have been other more expansive copper studies conducted by leading microbiologists around the globe that could provide insight into this question. Why isn’t bactericidal copper used more widely? Since ancient Egyptian times copper has been known to have inherent antimicrobial properties. But it wasn’t until recently (2008) that the U.S. Environmental Protection Agency (EPA) established test protocols which showed bactericidal copper’s effectiveness in killing bacteria and achieved registration status allowing for public health claims. Over the last several years, products made with bactericidal copper have become available and the demand has increased as people become aware of its bacteria-killing properties. In addition, the industry is continually working to educate the public about the properties of bactericidal copper. A recent poll showed that most people in the food and health industries (60%) still think stainless steel and plastic are the “cleanest” surfaces while only 8% identify copper. How widely will the findings of the study be communicated? Will the results be shared, for example, with hospitals and relevant medical associations? The study compares bactericidal copper with stainless steel. Are you saying that, bacteriologically, stainless steel surfaces are not safe? The Good Laboratory Practices testing that was conducted to gain EPA registration compared bactericidal copper’s ability to kill bacteria to stainless steel. The data unequivocally shows that bacteria thrives on stainless steel surfaces, while bactericidal copper continuously kills bacteria, even after inoculation. Stainless steel surfaces do not have inherent bacteria-killing properties, and therefore, they are not as clean as bactericidal copper surfaces. The Grinnell study confirms this – 93% of rooms with bactericidal copper surfaces remained at or near the recommended threshold1 for clean after terminal cleaning, while bacteria levels in control rooms with stainless steel surfaces rebounded above this threshold. The standard threshold for a benign, or clean, surface is <250 colony forming units of microorganisms per 100cm2. Anything above this thershold poses risk for microbial transmission. Based on the findings of the study, how can hospitals take action? What would you say to patients, medical staff, and other hospital workers? The Grinnell paper states in unequivocal terms: “Copper-alloys can significantly decrease the burden harbored on high-touch surfaces warranting inclusion in an integrated infection control strategy.” This study further builds on the growing body of evidence showing that bactericidal copper actively kills bacteria in healthcare settings. For administrators, patients and medical staff concerned about bacteria that cause HAIs, this should come as welcome news and bactericidal copper surfaces should be seriously considered as a supplement to their current infection control practices. Could the use of bactericidal copper cut down on the cost of hospital maintenance? Bactericidal copper surfaces should be used as part of a systems-based approach to hospital disinfection, as it is a great supplement to existing infection control protocols. Using bactericidal copper surfaces does not mean that a hospital should discontinue its regular cleaning and maintenance programs. Bactericidal copper can reduce bioburden around at-risk patients who are more likely to contract infections. This bioburden reduction is not only good for patients, but it’s good for hospitals, too. Bactericidal copper actively kills bacteria that are responsible for antibiotic-resistant infections and could potentially reduce any additional cleaning and/or maintenance that a hospital is considering implementing. How can bactericidal copper surfaces be used to supplement existing infection control practices? Until now the most effective infection control plans combined proven practices such as routine cleaning, hand washing, and good hygiene practices. CuVerro® bactericidal copper surfaces can enhance any infection control plan by providing a surface that continuously kills infectious bacteria 24/7. Does the use of alloys have an effect on the bactericidal intensity of copper? EPA registered bactericidal copper alloys will kill 99.9% of infectious bacteria* within 2 hours of exposure and continuously kill bacteria 24/7. All EPA-registered copper alloys perform to the same test standards independent of copper content (with a minimum of 60% copper). The Grinnell study used a CuVerro® copper-nickel alloy. No. EPA registered copper alloys inherently possess bactericidal properties. They are not treated with coatings nor undergo special fabrications to work against bacteria. In fact, products made with bactericidal copper should not be coated, as that will inhibit its antimicrobial ability. What is more, it will do the work continuously and constant for the life of the surface. Can copper surfaces be coated or waxed? No. Bactericidal copper alloys are “living metals" and it is the continued interface of copper ions with the environment that makes copper such an effective antimicrobial agent. Residual surface coatings, lacquers, waxes, oils, or films would obstruct the interaction between the bacteria and the copper that is essential to the antimicrobial action. Bactericidal copper alloys should never have residual surface coatings. Are you saying that stainless steel should no longer be used in places where there are high levels of infectious bacteria? How urgently should hospitals act on this information? The Grinnell study is the most recent in a growing body of research that shows that bactericidal copper surfaces are significantly more effective bactericides than stainless surfaces in healthcare environments. It is ultimately up to the hospital to make the decision to install bactericidal copper surfaces, which are indisputably more effective at killing bacteria than stainless steel surfaces. Stainless steel seems to be the default surface for many areas of potentially high bacteria counts, like rest rooms, kitchens, etc. Will copper help to reduce infectious bacteria in those environments as well? Yes. Any surface that is touched frequently by people or is in area where pathogens can thrive would be cleaner if the surface was made of bactericidal copper. Can you point to other instances where EPA-registered copper alloys may be in use today because of their bactericidal properties? CuVerro bactericidal copper is currently in hospitals, professional sports training rooms, fitness clubs, transportations centers, and other places where bacteria are a concern. Click here to see a map of US installations. Do you expect the steel industry to mount any sort of counter claims? Laboratory and clinical tests have shown time and again that bactericidal copper actively kills bacteria, while bacteria continue to thrive and grow on stainless steel surfaces between cleanings. Stainless steel has no inherent antimicrobial properties. What was the role of CuVerro (Olin Brass) in the Grinnell study? Did the brand pay for it? Did it have a say in the research protocols? Did it have a say in expression of the results? Olin Brass did not pay for, sponsor, or influence the research in any way. Olin Brass’s role was confined to supplying the copper alloy material used in the study. CuVerro affiliate manufacturers supplied the finished products. The fixtures were specified by GRMC. Are there other studies that show bactericidal copper’s ability to kill pathogens? Shannon Hinsa-Leasure is an associate professor of biology and an environmental microbiologist at Grinnell College in Iowa. Her research interests include microbial diversity, antibiotic resistance and genetic exchange, as well as bacterial adaptations to varied environments. She is currently investigating the ability of copper alloy materials to reduce bacterial loads in hospitals and fitness centers. Additionally, she is studying antibiotic resistance gene profiles on farms, in collaboration with researchers at Iowa State University and the Agricultural Research Service at the U.S. Department of Agriculture. As time permits, she continues her study of microbial diversity and biofilm formation in Siberian permafrost. At Grinnell, Hinsa-Leasure teaches courses in microbiology, environmental microbiology, cell biology and microbial pathogenesis. She also maintains an active laboratory with undergraduate students. Hinsa-Leasure earned her B.S. in bacteriology at the University of Wisconsin-Madison and her Ph.D. from Dartmouth Medical School in molecular and cellular biology. Queenster Nartey earned her B.A. in biological chemistry from Grinnell College in May 2016 and is currently serving as a fellow in the toxicology department at the U.S. Food and Drug Administration’s Oak Ridge Institute for Science and Education in College Park, Maryland. While a student at Grinnell, Nartey worked closely with biology professor Shannon Hinsa-Leasure on research investigating the antimicrobial properties of copper in hospitals and fitness centers. She presented this work at the Annual Biomedical Research Conference for Minority Students in Seattle, Wash., in 2015, where she was recognized with an Outstanding Poster Presentation in Microbiology award, and at the Louis Stokes Alliance for Minority Participation Iowa Illinois Nebraska STEM Partnership for Innovation in Research & Education Annual Conference, where she finished second in the student poster competition. Nartey plans to pursue her graduate degree following the completion of her FDA fellowship. Justin Vaverka earned his bachelor’s degree in biology from Grinnell College in May 2015 and just completed his first year of medical school at the University of Iowa's Carver College of Medicine in Iowa City, Iowa. While a student at Grinnell, Vaverka completed a Mentored Advanced Project (MAP) with biology professor Shannon Hinsa-Leasure, titled CuAlloy Microbe Research, which looked at antimicrobial copper alloys installed at Grinnell Regional Medical Center. Since 2014, Vaverka has also been working on a study at University of Iowa Children’s Hospital that evaluates the longevity of pacemakers in patients with congenital heart diseases, as well as long-term outcomes. He has presented this research at the Medical Student Research Day in Iowa City, Iowa, and at the Midwest Pediatric Cardiology Society in Peoria, Illinois. After completing medical school, Vaverka is considering pursuing a sub-specialization within pediatrics. Michael G. Schmidt earned his Ph.D. from Indiana University, Bloomington. Dr. Schmidt is a professor and vice chair of microbiology and immunology at the Medical University of South Carolina and was elected to fellowship in the American Academy of Microbiology. Currently, he is leading an inter-institutional/ interdisciplinary team of professionals investigating the role that microbes associated with objects present in the built clinical environment of hospitals play in the acquisition of a healthcare acquired infections (HAI). This group of infectious disease specialists, infection control professionals, architects and engineers are building on the success of a previous multi-center clinical trial where he and his colleagues established that by controlling burden in the built clinical environment through the introduction of the limited and targeted placement of solid copper alloys, they were able to significantly reduce HAI acquisition rates by 58%. The results from this study were the basis of a talk he provided to TEDxCharleston. Dr. Schmidt is active in the educational missions of the Colleges of Medicine and Dentistry at MUSC. He serves as a invited reviewer for the literature of his field and is the chair of the Branch Organization Committee for the American Society for Microbiology, was a member of that society’s Communications Committee, co-chaired the development of their career poster, and facilitated the revision of the society’s public website, Microbeworld.org. He has led numerous, national workshops on the use of information technology in medicine, microbiology and infectious diseases, has twice been a panelist on Science Friday, was the former content editor for Microbeworld radio, and presently serves as regular contributor to the internationally recognized podcast This Week In Microbiology (TWiM).